It’s time for an XOXpert review! 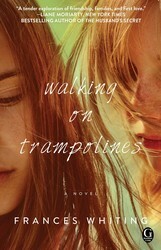 Zandalee is here with a review of Walking on Trampolines by Frances Whiting, a coming-of-age novel equal parts heartwarming, accessible, and thought-provoking. After reading the first few pages of this book I felt an oddly close connection to it. I’ve never gone through most of the things our main character here does, but the realness of the events allowed me to connect with her entirely. The events in this book aren’t shockingly unrealistic or absurd, they’re very much everyday life happenings that anyone can go through. Neither the setting (Australia) or time period (late ‘70s-early ‘90s) takes away from the relevancy of the story. Frances Whiting’s beautifully detailed story makes it easy to step in the main character’s shoes. This is the story of two best friends, Tallulah de Longland and Annabelle Andrews. Together they have highs and lows, both sharing the commonality of being born to parents that are extremely out of the box and at times, not fit parental units. Whether they’re having a good day or a bad day these girls are united every step of the way. That is until a new addition to the group slowly shifts their friendship, and in one quick instant, Tallulah loses two of the most important people in her life. That serenity and safety that swirled around the girls’ friendship is torn away. Tallulah has never been able to recover from that day, instead she’s built walls and secluded herself from the world. It isn’t until meeting her boss, Duncan McAllister, that she’s able to begin even considering getting closure and healing from the betrayal that slammed into her from both sides. The back and forth between past and present took some time to get acclimated with. I was trying to get a feel for the younger versions of the characters when the story would abruptly shift to another period of time. The same thing happened when I was in present day. The lack of smooth transitions, or in most cases the lack of transition at all was something that disrupted the flow for a bit, but it wasn’t a grave enough factor to completely ruin my reading experience. The jumps were however necessary for the reader to piece together Lulu’s life and figure out what led to the shocking beginning of the story. What made this story so complete was the various personalities that made up Tallulah’s world. Witty, quirky and each unique in their own way, these characters gave life to the book and each pivotal moment of Tallulah’s life. Her friendships were unorthodox and yet extremely entertaining. This Australian author’s debut novel is a coming of age story that will teach you life lessons no matter at what age you read it. It’ll take you through points of jealousy, insecurity, anger, loneliness and love. It’ll show you how important family and friends can be and to value both. The soulful storytelling will make you feel as though you’re holding Tallulah’s hand as she experiences life and the transition into adulthood. I’m so glad I had the opportunity to read this book and be introduced to Frances Whiting’s writing. Her style is one that makes an impression instantly and because it did so with me, I’ll be watching out for whatever she comes up with next. This review was previously featured on Zandalee’s blog, Valley of the Book Doll. This one is on my TBR and I’m hoping to read it soon! I’m glad you liked it Zandalee, I love a coming of age story about friendships and life lessons.